The Queen has marked Armistice Day by unveiling an Australian War Memorial in Hyde Park Corner, London. Crowds gathered to watch the ceremony, attended by Prime Minister Tony Blair, Australian PM John Howard and 27 Australian veterans. The memorial honours the 102,000 Australians who died in the two world wars, and the million or so who fought. the ceremony at 1100 GMT to honour all those who lost their lives. The silence, on the 11th day of the 11th month, marks the exact moment when the guns fell silent at the end of World War I in 1918. The two minutes' silence at the London dedication ended with an RAF fly-past. A service of dedication then took place, with short addresses from Mr Howard and the Queen, before the memorial was unveiled. Mr Howard said the memorial symbolised Australia and Britain's common history in standing together in the name of freedom. "Whatever the future may hold for our two nations, we are tied for all time by our history, by shared language and law - but most important of all, by an enduring belief in human dignity and the democratic freedoms that should be the birthright of all," he said. The Queen said the monument would stand as a permanent tribute to Australia's partnership and sacrifice in a common cause. "We will be eternally grateful at how, in our darkest hour, Australia stood by our side," she added. 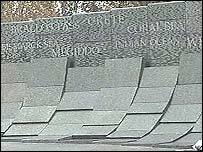 The memorial is in the form of a long curving wall of Australian granite, with falls of water, and set with the names of the 24,000 home towns of Australian men and women who served during the two world wars. Relative to its population, Australia suffered more losses than any other nation in World War 1. Other dignitaries attending the ceremony included former UK prime minister Baroness Thatcher, Australian leader of the opposition Simon Crean, Australian foreign minister Alexander Downer, Australian minister for veterans' affairs Danna Vale, and UK Defence Secretary Geoff Hoon. The whole area was closed to traffic, with a live video screen in Green Park for the overflow. The Queen and Mr Blair also led tributes at the annual Remembrance Day service in London on Sunday, laying wreaths at the Cenotaph in Whitehall. The ceremony was first held in 1921 to remember those who gave their lives during World War I. It now includes all who have died in conflict in the service of their country, including more than 50 British soldiers who died in Iraq. Three World War I veterans, all aged over 100, 10,000 ex-servicemen and women and some 1,600 civilians joined a march past the country's main war memorial. 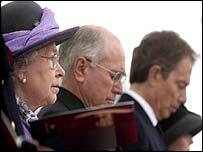 Services were also held across the UK and by British soldiers in Iraq. This year friends and relatives of servicemen and women who died in non-combat situations also laid a wreath of poppies at the Cenotaph. Geoff Gray, whose 17-year-old son Geoff died at Deepcut Army barracks, in Surrey, was among those paying tribute. I am very pleased to read about the new Australian Memorial in London. It is important that we never forget the bravery and suffering of the Australians who fought for us. My own uncle (Australian Infantry) died at Pozieres, the Somme, in July 1916 and has no known grave. I am heartened by the huge number of people who visit the war cemeteries and memorials in the Somme to pay their respects. We must never forget. Yes, I took part in the two minutes silence at my place of work, where an announcement on the tannoy system asked people to be silent at 11am. In the silence, as always, I remember my Uncle Alan, who gave his life in the war aged 18, and by doing so allowed me to lead a happy long life untroubled by having to fight in wars. Today is my 55th birthday as well as Rememberance day. Although I live 6 time zones away, I set my alarm every year to wake up and think of all the war dead, including my father's brother, who is buried on a small island just of the coast of France. He died when the Lancastria was sunk in 1940. So yes, it is a very important day that always brings mixed emotions. As a child I remember the moments of silence that I experienced with my Mom, in school or at church over the years. She would explain why we were pulled over on the side of the road, or merely stopped what we were doing as being a gesture of respect not only to those who died during war time all over the world, but to my Uncles and Grandfather who served in both WWI and WWII. I asked my co-workers today if they planned to observe the moment of silence this morning and they said they didn't know what I was talking about. I am concerned that so many gestures of respect and remembrance are going to be lost in the hustle and bustle of our over extended lives as we appear to care more about making money or gaining a car length in traffic than showing respect. I am pleased that we remembered the fallen here at my work, a London Borough Council. It's so important to reflect on the sacrifices made by those who went to war and those they left behind. I'm an Australian and unfortunately couldn't attend the unveiling ceremony at Hyde Park Corner, but will certainly pay my respects at this new memorial on the weekend. However, it angers me that John Howard was present to bask in the glory of this day, when he has fully supported the US in it's invasion of Iraq, and while we still have troops there. Bring our boys and girls home! My fiancé fought in the second Gulf war this year, my father in the first gulf war, my grandfather in the second world war and my great great grandfather in the first world war. This is very close to my heart. Armistice day is as important now as it was 90 years ago. It saddens me that every year I see less and less poppies WORN, we must never forget what these men and woman have done for us especially in the celebrity worshiping culture we have. As a young 20 year old I am appreciative of the sacrifices that my grandparents and their parents and all veterans of our country made so that I can live in the world I do now. With freedom, democracy and pride. As my job is to work in the states I understand the importance America places on its veterans and we should all be thankful and proud that people gave their lives so that we can live in the world we do now. My thoughts are with the many veterans of the UK, USA and Australia as well as our other allies, I will always owe a debt of gratitude. As a student, I found it absolutely disgusting today when I found out my school had not planned to observe the 2 minutes silence. My German teacher, however, whose class I was in at 11 O'clock had the respect and dignity that I feel my school should have had and she made us do it in the lesson, followed by a prayer after. My granddad's brother's plane was shot down back then so it is equally important for some people who have relatives that died. We need to remember these people, not be ignorant and forget them. They fought for this country and we take our living these days for granted. Words are inadequate, it is only by listening to the silence that we can really appreciate the ultimate sacrifice given by so many for our and future generations. Yes, let us never forget and let us always remember on both Remembrance Sunday and Armistice day. Perhaps I am unusual but I have never yet seen the poppy wreaths laid on memorials vandalised. I think that says a lot for the respect the memorials are held in. I also would like to point out that my town (Bury St Edmunds) also has a remarkable memorial to those lost in the Boer War - again well respected. I try to observe the two minutes on the 11th but usually fail - I always attend a memorial service. I work in Docklands in London and no 2 minute silence was observed anywhere. I left the office for 2 minutes to observe it myself. It's a disgrace. We observed the two minutes silence at work. Two minutes is not a lot of time to remember and gives thanks to all those who gave all their futures for ours. As an Australian who has lived most of my life in the UK, it was a proud moment to watch the new memorial unveiled and was a more poignant 2 minutes silence than any I have ever observed. All the moreso, to do so while watching my father who served in WW2, Korea and Vietnam. It was good to see the old fella, who'd travelled over especially, with all his medals and he looked particularly proud. Like all those mentioned here, I feel that remembrance is vitally important. Remembrance not only of the fallen, but of all the sons and daughters, mothers, fathers, sisters, wives and lovers left behind by each and every death. I remember a tombstone with the inscription: "To the world he was a soldier; to me he was the world." I too cannot keep tears from my eyes at the thought of so much loss. I am an Australian living in London and attended this morning's memorial service at Hyde Park Corner. I think it's important to have the two minute silence as a mark of respect to those fallen at the hands of war. It doesn't take much to take two minutes out of our busy lives to remember those who have ensured we can live with the freedom that we do today. Our Family Has been Military since 1066 and, modern times My brother Harley fought in WW1, I and my brothers fought in WW2, I went on and Fought in Korea and Vietnam. We in America are proud of our Allies, Britain, Australia, and the other English Empire countries who fought with us. In three hours we will observe the minutes of silence here in America at 11:00, of the 11th Day of the 11 month. We also have observed the 11:00 hour Remembrance day in England, God Bless all our veterans living or dead. I believe passionately in Remembrance but am ashamed to say that the silence was not observed in our NHS office. Two minutes is all it takes and I think we should continue with this tradition for the sake of all our children - the Falklands was the first conflict in my lifetime but that doesn't mean you forget the others. I'm surprised but glad that so many youngsters appreciate its significance. I think it is a very minimal request to ask for two minutes silence. It shows that we as a nation give thanks for the sacrifices not only by our fallen Servicemen but for all the people who fought and worked in the many campaigns that this country has entered these include News Reporters, Red Cross workers, Aid workers etc, so let us not forget those who stand up and show their dedication to duty and beliefs by delivering News, help, support as well as their lives in the time of war. I observed the silence at work this morning as we all should. I visited the battlefields in Verdun, France in 1995 and it changed my life. All schoolchildren should visit there as part of their education to realise the importance of Peace and the sacrifices that were made. "They shall not grow old as those of us who are left grow old. Age shall not weary them, nor the years condemn. At the going down of the sun and in the morning we will remember them". The two minute silence (observed by me here in the Czech Republic as a former Royal Marine) is a touching and poignant way to remember those who made the ultimate sacrifice not only in World Wars but also in the smaller conflicts that continue to litter our world. Remembrance should not be a national thing - we should remember those who died from all sides during the silence. I was shocked today that at 11 o clock we did not mark the minute silence however i marked it myself on my own in the school chapel. I am a 16 year old student and i think it is very important that the people who fought and died for our country should not be forgotten. This day moves me every year and i fear of it not being marked any more. So let us not forget 'Those who have Fallen'. being an English person abroad, it matters more to me now than ever, I will have my own two minute silence here...it's a shame some people are of the opinion that it is an outdated practice, do these same people realise that we wouldn't be here today were it not for these brave valiant men and women? I think taking two minutes out of your day to say thank you really isn't much to ask of anyone. Thank you to all the British and Australian servicemen who gave their lives courageously fighting WWII and the Communist insurgency in Malaya. Without them we would not have the freedom, peace and prosperity we enjoy today. Remembrance Day is very important to me as I lost my father Capt/Surgeon Charles Veall RAMC 17th July 1944, following the Normandy landings. He was 24 and I, three months. He is buried in France along with those colleagues who fell with him. I was at university this morning during the two-minute silence and I was shocked that it was not observed during our lecture. My generation has never seen a war of such magnitude as the two World Wars and it is important that we remember those who have given their lives in order that we do not see such a war again. I would have expected a university to appreciate this point and encourage its students to observe the silence but unfortunately this was not the case. Yes, I did take part in the two-minute silence this morning. Remembrance Day is very important to both me and my family so much so that I ensure that we always have a Poppy Box at my office. It is a shame that youngsters today do not realise that it now includes military personnel killed in more recent conflicts. We owe them a great deal. It is the least we can do. I am 17 years old and am aware that many people think my generation are apathetic about Remembrance Day. However, I am pleased to say that at 11:00 today, pupils at my college showed the greatest respect - regardless of their ethnic or social background - to those who died. The young really do care. Some people say its becoming an outdated practice, I disagree, I think it's vitally important that we have a day when we can come together and honour our dead who have fought for our country in the various wars throughout history. They gave up their lives for us, it's the least we can do. I do think that it is still associated more the with WW1 and WW2 and more should be made to include remembrance of those in more recent wars. The two minute silence and the Remembrance weekend in general should definitely be observed since we are still asking our Service personnel to risk their lives. Remembrance is NOT just about WW1 and WW2 - although clearly the scale of those conflicts mean that they are rightly given high visibility at this time of year. Remembrance is about ALL conflicts since WW1 - many of them very recent and of course some still under way. Our office observed the silence, as we do every year. This is a day that is more important than too many realise. We ignore our past to the peril of our children. I am a Brit living permanently in the USA. Yes, the two minutes silence is exceptionally important, to me and to us all, these men and women gave up their lives for our freedom. It is precious to remember them, and to keep telling coming generations, every year, how precious that freedom is and how many lives were and are given up to win it and keep it. We will never forget them. Remembrance day and Armistice day is extremely important - more so now than ever. I symbolises the sacrifice that our men and women gave in order that we may live in freedom. Two minutes out of your life is nothing compared to the ultimate sacrifice. I am getting ready to take part in this morning's service at Parliament Hill in Ottawa, Canada. It is very nice to see a war memorial dedicated to the Australians for their contribution to the war effort and for their insurmountable losses. Just one question, is there a Canadian memorial in England? I would like to think that there would be. To Mandy McIlveen, of Canada: In the Brecon Beacons there is a memorial to the Canadian crew of a Lancaster bomber that crashed in the mountains, returning from a mission over the continent. Sadly, the crew all passed away. It is not an easy place to get to, as the Beacons is wild country, but it has been for many years, the place where hikers and mountaineers go to pay their respects, to the men and women of Britain, and to those from overseas, on 11th November. Granted, it's not official, but we are thankful... so we go there. In response to Mandy McIlveen's query about a Canadian war memorial in the UK- yes there is one in Green Park, close to Buckingham Palace...but sadly it seems to have been neglected somewhat. Wreaths are never laid, there has not been a ceremony recently and the structure itself is often climbed upon by tourists and children. A sad state of affairs considering Canadian troops involvement during WW1 and WW2. Lets hope the same does not happen with the Australian memorial! I remember my grandmother's making us observe the moments of silence on Armistice Day when we were children. It has so much meaning to me now, not merely as a former serviceperson, but in tribute to all those brave and frightened souls who gave their lives for our freedom. Yes I took part in the two minute silence and feel it is very important. It shows to those that have lost loved ones that their bravery and courage will never be forgotten, as much as to the men/women themselves. Remembrance Day is important to me as we remember those who have fallen in all wars. It does not condone or object to those wars and is set apart from the governments of the day who sent young men (and now women) to the trenches or the desert. The fallen should be remembered always as the true cost of war, in uniform on both sides or innocent civilians caught up in the conflicts. Of course I took part, both today and on Sunday. Two minutes is not long to honour those who were brave enough to sacrifice their lives for mine. I always get a tear in my eye during that time and for the record I was born well after WWII. To me Remembrance Day means mostly the First World War. Very, very few who took part actually survive today and unlike WW2, there is relatively little film evidence. The sacrifices that took place to preserve our way of life should never be forgotten. My former unit, the 972 Military Police Co, just returned from duty in Afghanistan; JOB WELL DONE! In Remembrance of Great Britain's proud and honourable young fighting men who've made the ultimate sacrifice in Northern Ireland; LEST WE FORGET! God Save Her Majesty The Queen! God Bless The United States! UNITED WE STAND! I fully agree with maintaining the two minute silence each year as the minimum mark of respect that we can give for those millions of men and women who gave their lives in the duty of their country's defence. Many millions more also bore enormous scars and suffered considerably because of their commitment and sense of duty. A mere two minutes silence each year is a pathetically small price to pay for such sacrifice. I did take part in the two minutes silence this morning at Waterloo Station however I was bitterly disappointed that so many other people choose to ignore the occasion. Can people really be that busy that they can't spare two minutes of their lives to show their appreciation and gratitude for the sacrifice of so many in order that they may continue with their lives in the way that we have now all be accustomed. They should be ashamed of themselves. The fact that we are able to post our comments on the national media is down to all who fought in WWII. That says it all to me. "For its size, Australia suffered the worst casualties of any nation involved in the Great War"